A crucial part of providing care is the ability to properly assess your residents. MED e-care’s eAssessment module allows users to perform all types of assessments on residents quickly and easily. Historical records are accessible for retrieval at any time, and reporting can be produced for any element of any assessment across the entire facility. MED e-care eAssessment include standardized assessments for many major sectors, from Long-Term Care to Rehabilitation, Mental Health to Retirement. Assessment data is verified automatically by the system and can be submitted to a governing body with just a few clicks. 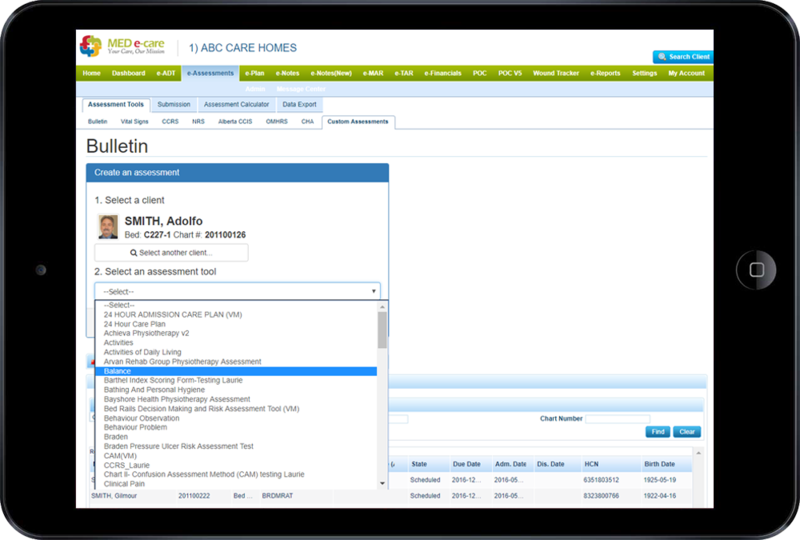 For forms that are unique to your facility, the Forms Builder module allows you to build custom assessments into your environment with an easy-to-use interface.